A rare species of beetle has been recorded in the Highlands for the first time, the Scottish Wildlife Trust has said. 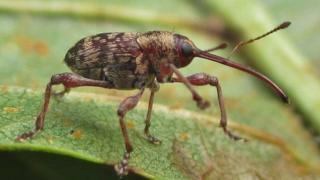 The Curculio betulae weevil was spotted on an alder tree at the trust's Talich Wildlife Reserve, near Tain, by moth recorder and naturalist Nigel Richards. Mr Richards said the beetle had only been recorded a "handful of times" in central Scotland. He added: "This is certainly the mostly northerly record to date." Growing to only 4mm in length and found on birch and alder trees, the weevil is characterised by a slender and evenly curved rostrum, or snout, which is as long as its body. They are most commonly spotted in England and Wales. Talich Wildlife Reserve is one of two remaining alder woods in the Moray Firth area. Reserve manager, Mark Foxwell, said: "Much of the wildlife of the Highlands is under-recorded so it is great to hear about a new record for both the region and the reserve. "As one of the last remaining woodlands of its kind locally, Talich Wildlife Reserve is a haven for lots of species and this just increases its importance."